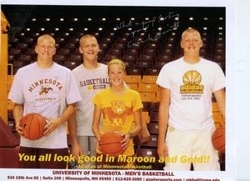 The Ellenson Family all dressed in maroon and gold - is this a sign of things to come? Henry Ellenson, a 6-foot-8 freshman from Rice Lake (Wis.) High, is one of the top players in the Midwest in the Class of 2015. He is one of three Ellenson brothers who shined for the Warriors, leading them to a 23-2 mark, losing to eventual Division II champion Onalaska 57-47 in the playoffs. Ellenson, who averaged 12.1 points per game this season, is expected to receive a scholarship offer from Georgetown Monday. Hoya head coach John Thompson III watched Ellenson play this past weekend. Gopher Hole caught up with Ellenson to learn the latest on his recruitment, his AAU plans and the possibility of playing with his brother again in college. Gopher Hole: You had a great week, wining the Best Buy Spring Classic 15-and-under title, one week after playing up and finishing second the Minnesota Pump N Run 16’s in the Comets Shootout. How pleased are you with how well your team is playing so far? Henry Ellenson: I am happy with our performance lately. I think that we are doing really good and I am excited for the rest of the year, obviously next week in Denver. I think that we have a good chance to win it. Gopher Hole: Are you surprised at how well you are playing because it is just you and Marshawn Wilson back from last year along with eight new players? Are you surprised by how you are having such good team chemistry so quickly? Henry Ellenson: Yes. I am kind of surprised at how things are going along so nicely with everyone doing a good job. Gopher Hole: Does this give you even more confidence going into a big tournament this upcoming weekend in Denver? Henry Ellenson: Yes, it does. Gopher Hole: How pleased where you with this past season, losing just two games and made a strong run in the playoffs? Henry Ellenson: I was pretty happy with this year and that we did so good. There were some games that I wished that we had done better, like the ones we lost, but I thought that we did good. Gopher Hole: What was the experience playing with both your brothers (Wally, a senior and Ellwood, a junior)? Henry Ellenson: It was fun because you would be on the court and see Wally doing good and you are cheering him on when you are teammates. It was a fun experience. Gopher Hole: Are you glad that you got to do that since next year he is going to be going to college? Henry Ellenson: I am glad that I got to play with him, so I was happy. It was kind of a big thing that we always wanted to do when we were growing up to play on varsity together. Gopher Hole: You lose Wally, Alex Cuskey, a 6-foot-4 forward and point guard Joe Shervey to graduation. What are the expectations for next year? Henry Ellenson: Next year, I still think that we will be the top team in our conference and I think that we will still have a good chance to go to me and Ellwood returning. I think that we will be pretty strong next year. Gopher Hole: What things are you working on to improve yourself as a player? Henry Ellenson: Really be better off the bounce. Being a quicker, more athletic player is something that I think that I need to improve on. Gopher Hole: I know that it is still very early being only a freshman, but what schools are you hearing from right now? Henry Ellenson: I’ve heard from Indiana, Purdue,, Wisconsin, Minnesota, Nebraska. Kansas gave me a letter and also Marquette. Gopher Hole: Would you ever want to play with Wally in college? Have you ever talked about it? Henry Ellenson: Yes. Maybe that would be a possibility. Gopher Hole: What are your expectations for Minnesota Pump N Run this spring and summer? Henry Ellenson: This year, I think that we should be winning most of our tournaments, at least in my expectation. Winning the adidas Super 64 in Las Vegas. That is the main thing that I am looking forward to. Talk about Golden Gopher Basketball Recruiting on Tubby's Barn message board.